Introduction: The aim of the study was to investigate the root canal morphology of mandibular canines in a Saudi subpopulation using cone-beam computed tomography (CBCT). Materials and Methods: This retrospective cross-sectional study assessed CBCT images of 707 patients. A total of 454 mandibular canine teeth were evaluated. 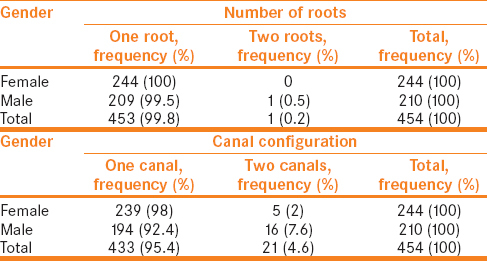 The number of roots and canal configuration was identified based on Vertucci's classification. The Fisher's exact test was used alongside the Chi-square test to analyze the association between gender and number of roots, as well as gender and root canal configuration. Results: Most patients had one root, 99.8%, while double-rooted mandibular canines were observed in 0.2%. Moreover, Type I, II, III, and IV canal configurations were observed in mandibular canines with Type I being the most prevalent canal configuration (95.4%). Fisher's exact and Chi-square tests showed no significant association between gender and number of roots (P = 0.463), while the presence of two canals was more frequent in men than in women with a statistically significant difference (P = 0.006). Conclusion: Single rooted with Type I canal configuration was the most prevalent in mandibular canines in the Saudi subpopulation. However, incidence of more than one root canal with different canal configurations was also detected. The success of root canal therapy is attributed to the proper shaping, cleaning, and filling of the root canal system which necessitates a thorough understanding of the external and internal anatomy of root canal system and its morphological variations., These variations play an important role in endodontic therapy and the failure of treating all root canals exists will lead to the persistence of microorganisms and necrotic tissues inside the canals and influence the treatment outcomes. Different morphological variations of root canal system have been investigated and classified by several investigators,,, and the most widely used is Vertucci's classification. To the best of our knowledge, no study has so far evaluated the root canal morphology of mandibular canines in Saudi subpopulation using CBCT. Therefore, the aim of the study was to investigate the root canal morphology of mandibular canines in a Saudi subpopulation using CBCT. The study was independently reviewed and approved by the local Institutional Review Board at King Saud University, Riyadh, Saudi Arabia #FR 0376 and conducted in full accordance with the World Medical Association Declaration of Helsinki. Seven hundred and seven CBCT images of patients (396 females and 311 males) aged between 16 and 79 years old seeking routine dental treatment who were referred to the Radiology Department of the College of Dentistry, King Saud University, between 2015 and 2017 were collected. The presence of at least one mandibular right or left canine with fully developed roots was recorded in each image. Unclear or distorted CBCT images, previous endodontically initiated or treated teeth, presence of posts or crowns, periapical lesions, and any physiological or pathological process such as immature apex were excluded from the study. The total final sample consisting of 454 mandibular canine teeth was evaluated in terms of number of roots and root canal configuration. The data were observed and recorded for the number of roots and canal configuration based on Vertucci's classification as shown in [Figure 1]. The gender of the patients was also recorded. The CBCT images were evaluated by two endodontists, with a 3 years clinical experience, for the number of roots and root canal configuration in the axial, sagittal, and coronal planes using the Planmeca Romexis Viewer software (PLANMECA, Roselle, IL, USA) as shown in [Figure 2], [Figure 3], [Figure 4]. The images were collected from different CBCT machines: CS9300 3D digital imaging system (Carestream, Rochester, NY) with a voxel size of 90–300 μm and Planmeca ProMax 3D (PLANMECA, Roselle, IL, USA) with a voxel size of ≤200 μm. The exposure time was <15 s and the sample included CBCT images with either small or large field of view (FOV). 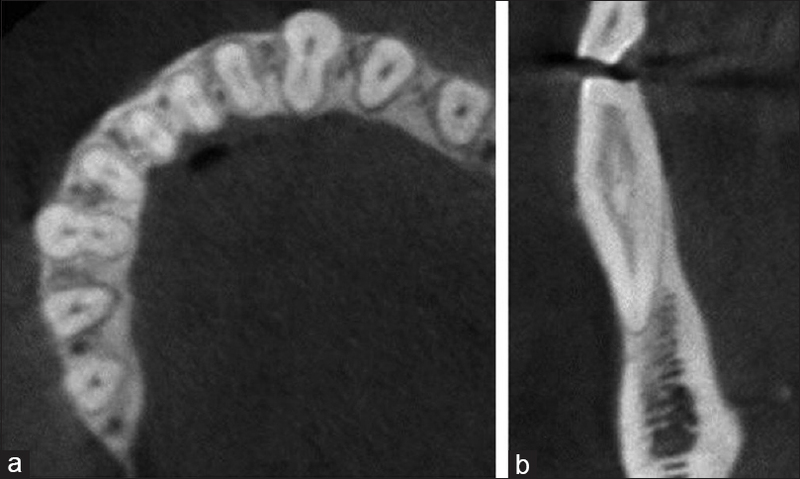 The CBCT cross-sections were 0.2 mm thick viewed from the coronal to apical regions. The contrast and brightness of the images were adjusted to ensure optimal visualization with the software. To ensure the reliability of the research results, inter-and intra-examiner reliabilities were measured by identifying the root canal anatomy of mandibular canines of 30 randomly selected CBCT images according to the evaluation criteria. For intraexaminer reliability, the same images were evaluated after 1 week. Both inter-and intra-examiner reliability were calculated using the interclass correlation coefficient (ICC). Data were analyzed with the Fisher's exact and Chi-square tests using SPSS software version 22 (SPSS Inc., Chicago, IL, USA). The level of statistical significance was set at P < 0.05. For interexaminer reliability, the ICC was 0.886 (excellent) for the number of roots and 0.625 (good) for canal configuration. For intraexaminer reliability, the ICC was 1 for the first examiner with regard to number of roots and canal configuration and 1 and 0.95 for the second examiner with regard to number of roots and canal configuration, respectively. The ICCs verified that the procedure was reliable for the evaluations and measurements performed by the two observers. Most of the teeth had one root (99.8%). Type I canal configuration (95.4%) was the most prevalent observation. The frequency and percentage of number of roots and canal configuration in mandibular canine teeth are shown in [Table 1]. A higher incidence of double-rooted mandibular canines was observed in men (0.5%) and none in women (0%), while the most predominant root morphology seen in both genders was single rooted with no statistically significant difference (P = 0.463). However, there was an association between root canal configuration and gender. Type II, III, and IV canal configurations were more frequent in male patients and Type I in female patients with a statistically significant difference (P = 0.006). In 259 patients, where the right and left mandibular canines were present, 97.7% of the teeth showed symmetrical number of roots and canal configuration while 1.9% showed symmetrical number of roots, but different canal configuration. Moreover, 0.4% of teeth did not show any type of symmetry. As early as 1870, the literature reveals periodic updates in the root canal morphology of teeth to learn more about their morphological variations, improve treatment techniques, and enhance treatment success rates. For this purpose, different methods have been used to study the root canal morphology. The CBCT technique used in this study provides a 3D view of the root canal system. Permanent mandibular canines were reported to have one root in 88.46%–100%, and double rooted in 0%–11.54%,,,,,,,, while the number of root canals in mandibular canine was reported to be one canal in 84.9%–100%, and two canals in 0%–15.1%.,,,,,,,,,,,,,,,,, Moreover, case reports of mandibular canines with three root canals have been published., Comparison of anatomical features of permanent mandibular canines in previous studies is shown in [Table 2] and [Table 3]. The most predominant root morphology in mandibular canine observed in this study was single rooted (99.8%), while double rooted was observed in 0.2%. 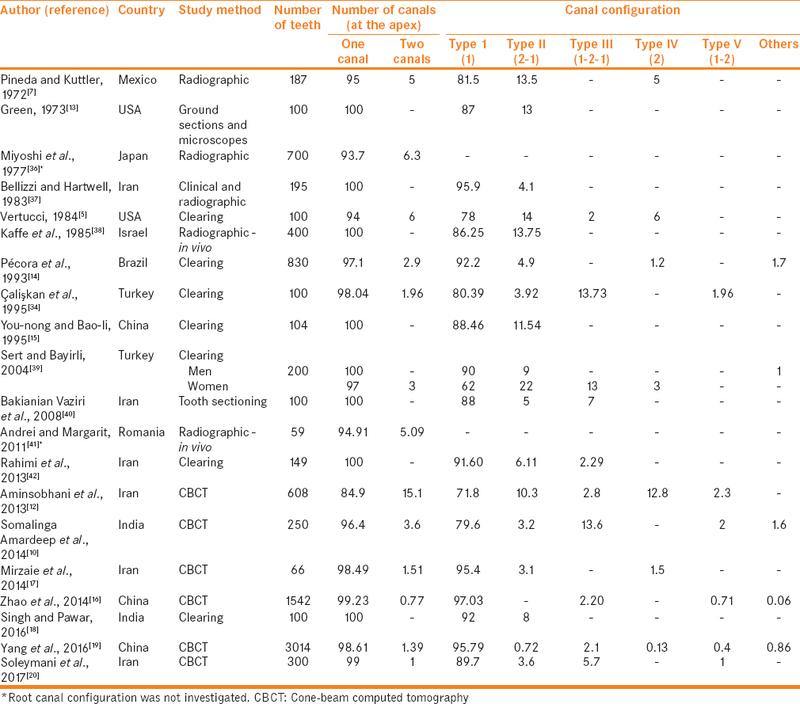 However, the prevalence of two-rooted mandibular canines in Saudi subpopulation in this study was higher than that in South Asian Indian population using the clearing method (0%) and Hamadani population in Iran using CBCT technique (0%). 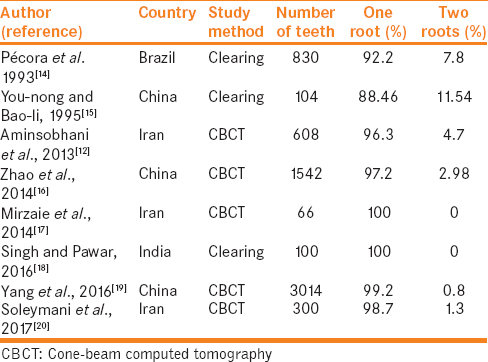 A higher prevalence was reported in Iranian (4.7%) and Chinese (0.7%) when the CBCT was the method used, and in Brazilian (1.7%) using clearing method. The variation in root canal morphology in the literature may be attributed to the difference in patient ethnicity even within the same population which is considered as a significant factor that may affect the perception of the clinician for the suspected root canal anatomy. 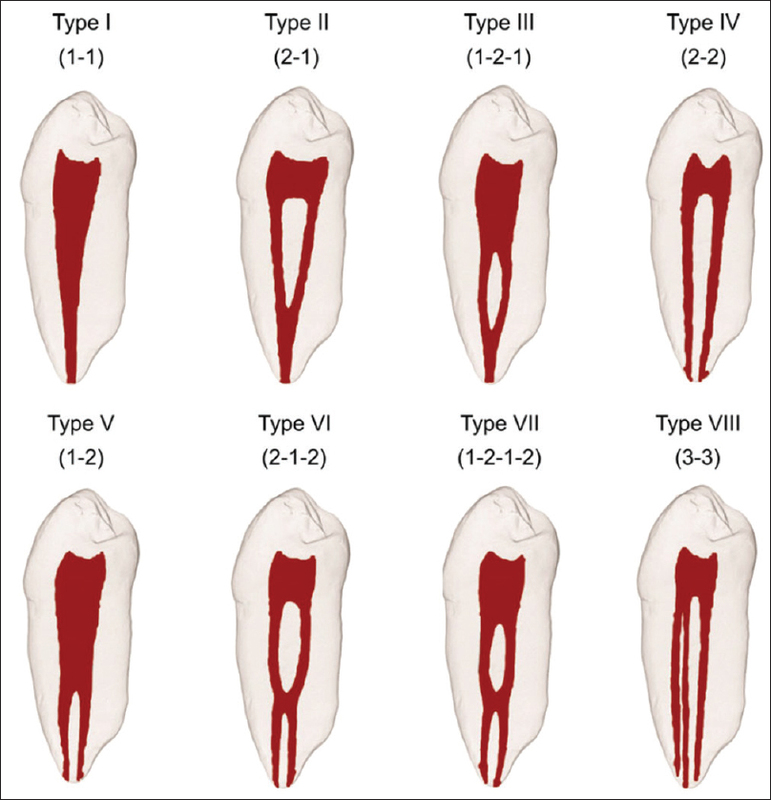 Most mandibular canines in the present study had Type I canal configuration (95.4%), followed by Type II (2.6%), and Type III (1.8%). Type IV canal configuration was observed in one tooth (0.2%). According to Vertucci's classification, Type I was more frequent (78%) than the other canal configurations. These findings were similar to other studies where the prevalence of Type I was reported to be 81.5% in Mexican population, 80.39% in Turkish, 95.4% in Hamadani population in Iran, and 92% in South Asian Indian population. Soleymani et al. reported that double-rooted canines and mandibular canine with two canals were significantly more common among men than women which coincides with the findings in our study. In contrary, Martins et al. reported that women had significantly more roots and root canals than men in mandibular canine. One study has compared the degree of symmetry in root canal morphology in contralateral mandibular canines using CBCT method and concluded that the probability of morphological bilateral symmetry in mandibular canines to be 95.4%, which is similar to the findings in our study were a high degree of symmetry was seen in mandibular canine in terms of the number of roots and canal configuration (97.7%). CBCT technique provides diagnostic abilities which measured by determining the accuracy, specificity, and sensitivity of each finding. The voxel size, which is the smallest 3D data unit in CBCT, can determine the patient's exposure to radiation. Therefore, dental professionals should be aware and follow the basic principles of (“as low as reasonably achievable” principle). In general, the use of a restricted FOV has become the best choice for the endodontic diagnosis. 0.3-mm voxel size has been reported that it has greater accuracy in detection of the second mesiobuccal root canal (MB2) and lower radiation exposure. Utilization of all the available armamentarium and diagnostic techniques before and during root canal therapy including preoperative angled radiographs, good access cavity preparation, proper inspection of pulpal floor, and a detailed examination of the interior of the tooth under magnification and CBCT, is necessary to aid in the proper diagnosis, negotiation, and treatment of different root canal anatomy to achieve adequate treatment outcomes. Before the conduction of this retrospective study, no studies had evaluated the anatomical features of permanent mandibular canines in Saudi population using CBCT. However, the findings of this study cannot be generalized to the whole population as the data of this study were collected from one center, King Saud University Dental Hospital, although it is considered one of the largest governmental dental institutes providing free dental services to large slice of Saudi population from different regions. Moreover, the preexisting CBCT images were accessed regardless of the voxel size used to avoid exposing large number of patients to unnecessary radiation dose and to achieve larger sample size. Within the limitation of this study, most mandibular canines had one root with Type I being the most predominant canal configuration in Saudi Arabian subpopulation. However, incidence of more than one root canal with different canal configurations was also detected and more frequently in men. Further studies are recommended with larger sample size to apply the results to the general population. The authors wish to thank Dr. Ahmed Qattan (General Practitioner, Thadiq General Hospital, Saudi Arabia) for his efforts in data collection. Peikoff MD, Trott JR. An endodontic failure caused by an unusual anatomical anomaly. J Endod 1977;3:356-9. Neelakantan P, Subbarao C, Subbarao CV. Comparative evaluation of modified canal staining and clearing technique, cone-beam computed tomography, peripheral quantitative computed tomography, spiral computed tomography, and plain and contrast medium-enhanced digital radiography in studying root canal morphology. J Endod 2010;36:1547-51. Weine FS, Healey HJ, Gerstein H, Evanson L. Canal configuration in the mesiobuccal root of the maxillary first molar and its endodontic significance. Oral Surg Oral Med Oral Pathol 1969;28:419-25. Somalinga Amardeep N, Raghu S, Natanasabapathy V. Root canal morphology of permanent maxillary and mandibular canines in indian population using cone beam computed tomography. Anat Res Int 2014;2014:731859. Versiani MA, Pécora JD, Sousa-Neto MD. Microcomputed tomography analysis of the root canal morphology of single-rooted mandibular canines. Int Endod J 2013;46:800-7. Aminsobhani M, Sadegh M, Meraji N, Razmi H, Kharazifard MJ. Evaluation of the root and canal morphology of mandibular permanent anterior teeth in an Iranian population by cone-beam computed tomography. J Dent (Tehran) 2013;10:358-66. You-nong W, Bao-li Y. Morphology research of 1976 permanent root canal. J Pract Stomatol 1995;11:98-101. Zhao Y, Dong Y, Wang X, Wang Z, Li G, Liu M, et al. Cone-beam computed tomography analysis of root canal configuration of 4 674 mandibular anterior teeth. J Peking Univ Health Sci 2014;46:95-9. Mirzaie M, Zaban P, Mohammadi P. Cone-beam computed tomography study of root canals in a hamadani population in Iran. Avic J Dent Res 2014;4:25-31. Singh S, Pawar M. Root and canal morphology of mandibular incisors and canines in South Asian Indian population by canal staining and tooth clearing technique. Endodontology 2016;28:148-53. Yang Z, Lu K, Wang F, Li Y, Zhou Z. Cone-beam computed tomography study of the root and canal morphology of mandibular permanent anterior teeth in a chongqing population. Ther Clin Risk Manag 2016;12:19-25. Soleymani A, Namaryan N, Moudi E, Gholinia A. Root canal morphology of mandibular canine in an iranian population: A CBCT assessment. Iran Endod J 2017;12:78-82. Rahmatulla M, Wyne AH. Bifid roots in a mandibular canine: Report of an unusual case. Saudi Dent J 1993;5:77-8. Balto HA, Al-Wakeel M. Mandibular canine with two root canals-case report. Egypt Dent J 2007;53:2535-8. Alenezi MA, Al-Hawwas AY. Permanent mandibular canine with two roots and two root canals: Two case reports. Saudi Endod J 2016;6:98-100. Al Dahman YH, Al Hawwas AY. 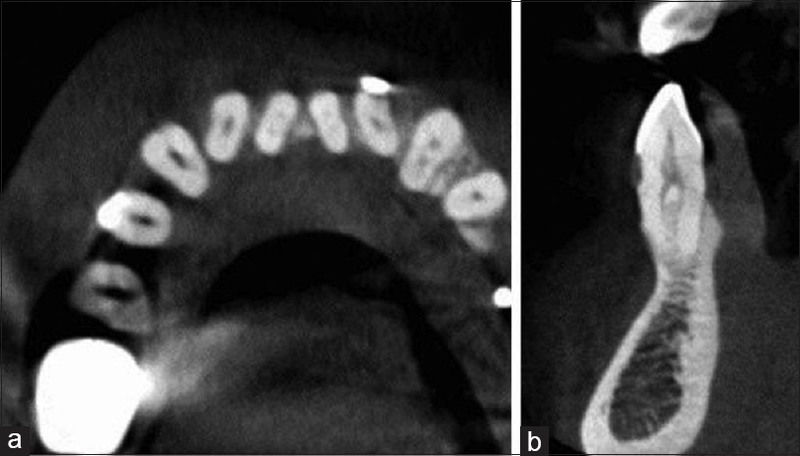 Root canal retreatment of permanent mandibular canine with two canals-A case report. Adv Dent Oral Health 2017;4:555626. Atieh MA. Root and canal morphology of maxillary first premolars in a Saudi population. J Contemp Dent Prac 2008;9:46-53. Pattanshetti N, Gaidhane M, Al Kandari AM. Root and canal morphology of the mesiobuccal and distal roots of permanent first molars in a kuwait population – A clinical study. Int Endod J 2008;41:755-62. Al-Fouzan KS, AlManee A, Jan J, Al-Rejaie M. Incidence of two canals in extracted mandibular incisors teeth of Saudi Arabian samples. Saudi Endod J 2012;2:65-9. Grover C, Shetty N. Methods to study root canal morphology: A review. ENDO (Lond Engl) 2012;6:171-82. Plotino G, Grande NM, Pecci R, Bedini R, Pameijer CH, Somma F, et al. Three-dimensional imaging using microcomputed tomography for studying tooth macromorphology. J Am Dent Assoc 2006;137:1555-61. Ahmed HM, Versiani MA, De-Deus G, Dummer PM. A new system for classifying root and root canal morphology. Int Endod J 2017;50:761-70. Çalişkan MK, Pehlivan Y, Sepetçioǧlu F, Türkün M, Tuncer SŞ. Root canal morphology of human permanent teeth in a Turkish population. J Endod 1995;21:200-4. Miyoshi S, Fujiwara J, Tsuji YH, Nakata T, Yamamoto K. Bifurcated root canals and crown diameter. J Dent Res 1977;56:1425. Bakianian Vaziri P, Kasraee S, Abdolsamadi HR, Abdollahzadeh S, Esmaeili F, Nazari S, et al. Root canal configuration of one-rooted mandibular canine in an iranian population: An in vitro study. J Dent Res Dent Clin Dent Prospects 2008;2:28-32. Andrei OC, Margarit R. Anatomical variations of mandibular canines in a romanian population and relation to prosthetic treatment. Rom J Oral Rehab 2011;3:89-94. Rahimi S, Milani AS, Shahi S, Sergiz Y, Nezafati S, Lotfi M, et al. Prevalence of two root canals in human mandibular anterior teeth in an iranian population. Indian J Dent Res 2013;24:234-6. Holtzman L. Root canal treatment of a mandibular canine with three root canals. Case report. Int Endod J 1997;30:291-3. Heling I, Gottlieb-Dadon I, Chandler NP. Mandibular canine with two roots and three root canals. Endod Dent Traumatol 1995;11:301-2. Martins JN, Gu Y, Marques D, Francisco H, Caramês J. Differences on the root and root canal morphologies between asian and white ethnic groups analyzed by cone-beam computed tomography. J Endod 2018;44:1096-104. Martins JN, Marques D, Francisco H, Caramês J. Gender influence on the number of roots and root canal system configuration in human permanent teeth of a portuguese subpopulation. Quintessence Int 2018;49:103-11. Vizzotto MB, Silveira PF, Arús NA, Montagner F, Gomes BP, da Silveira HE, et al. CBCT for the assessment of second mesiobuccal (MB2) canals in maxillary molar teeth: Effect of voxel size and presence of root filling. Int Endod J 2013;46:870-6.